Djeco are a French company who make unique toys for 2 year olds. I discovered them while on holiday in France this year and was truly impressed by how stylish and unusual their toys are. Unlike boring mass-produced toys which are usually made from plastic, Djeco’s toys for 2 year olds are beautifully designed and something to treasure for years to come. They have obviously been designed by people who really understand children and what sort of toys will appeal to them. A refreshing change in today’s over-commercialised world. Djeco are probably best known for their beautiful arts and crafts sets for older children. 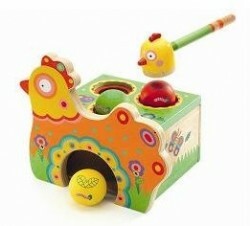 However they also produce a good selection of toys for 2 year olds and other pre-school ages. Here’s my selection of the most unique Djeco toys for 2 year olds. Djeco have produced a lovely version of this traditional children’s game. 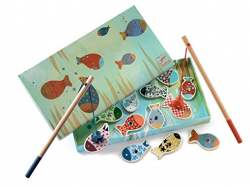 The box transforms into a pond for the uniquely decorated wooden fish to swim in. The fish are magnetic and 2 year olds will enjoy taking it in turns to catch the fish. This is a unique game to improve a 2 year old’s growing fine minor skills, helping them learn to use their hands in more accurate ways. It’s suitable for children from age 2 upwards and is stylish enough continue to provide entertainment for older children. It’s a good game for children to play with their friends as they get older and learn how to share and take turns. Most 2 year olds are just starting to show an interest in jigsaws. At this age, jigsaws need to be kept very simple with just a few pieces. 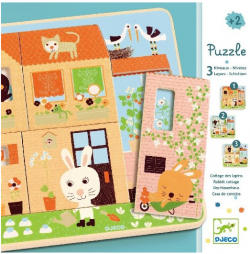 Djeco have created some really unique easy jigsaws perfect for 2 year olds and pre-school children. The Rabbit Cottage and Tree House beginner jigsaws engage children’s imaginative play as well as being a jigsaw puzzle. They have a unique 3-layer structure with separate pieces for the outer wall, inside the house and the animals themselves. The artwork is beautiful with plenty of cute animals and bright (but not tacky) colours. There are lots of building block toys for 2 year olds, but this is probably the most unique one I’ve seen. It’s also the most interesting and educational. 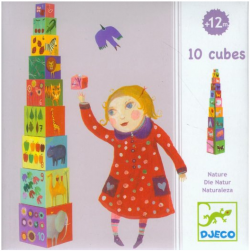 Djeco’s Nature and Animal Blocks is a set of 10 building blocks. It comes in bright colours beautifully decorated with animal and nature pictures. Very young children will enjoy learning how to build a tower and recognising the animals. Older pre-schoolers will enjoy counting the animals, too. The blocks are made from strong paperboard. They nest together for easy storage. This toy is designed for children aged 12 months and older. It will continue to appeal until they are probably about 4 years old. There are lots of shape boards for 2 year olds but Elephantastic Wild Animals is definitely the most unique one I’ve seen, and also the nicest and best quality. 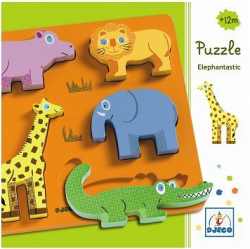 It consists of a puzzle board with 5 animal pieces – a hippo, lion, giraffe, elephant and crocodile. Each animal is nicely painted and colourful without being garish. The pieces are nice and chunky, making it easier for 2 year olds to manipulate them into the holes. This is an educational toy designed to help 1 and 2 year olds as well as older pre-school children to develop object identification skills, manual dexterity and shape matching. These are all skills that 2 year olds are actively developing, so it’s a very age-appropriate toy. 2 year olds are at a very early stage of their jigsaw-making skills. Very simple 2-piece jigsaws are perfect for this stage of development. 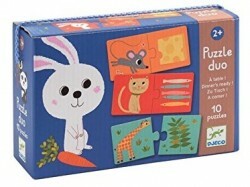 Djeco’s Mom and Baby Puzzle Duo is a unique example of a jigsaw for 2 year olds because of its mother and baby theme. 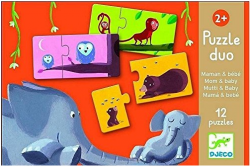 There are other mini jigsaws with cute animal pictures or number matching, but I like the way that this jigsaw is all about matching a baby animal with its mummy. Most 2 year olds are obsessed with the mother/child relationship and what this means to them, so this jigsaw will definitely appeal. All children have different learning styles, so it’s good that this jigsaw provides several different ways to match the pieces together. 2 year olds will enjoy matching the mother to the baby or match by background colour, so this game helps with colour recognition too. 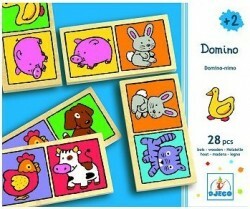 Another 2-piece jigsaw set by Djeco, this toy encourages 2 year olds to match the animal with its food or simply match the background colours. The pieces are nice and big, making them easy for a 2 year old to get their hands around and slot them together. Personally, I would choose the Mom and Baby Puzzle Duo over this one because I love the mother and baby matching concept and think it will appeal the most to 2 year olds. However the idea of matching an animal to its food also makes this a unique jigsaw toy, and it’s also a good choice. Parents of 2 year olds have the constant dilemma of whether to give their child stickers. All stickers are labelled as being for age 3 and above, as 2 year olds are likely to eat them! Stickers are also tricky for little fingers to manipulate which can cause frustration and lead to tantrums. Magnets are a great alternative to stickers for 2 year olds. They have the same benefits of stickers, as the child can stick them to different things and make changes to their environment, which gives them a feeling of control. However magnets are much easier to use and perfect for children who haven’t quite mastered stickers yet. 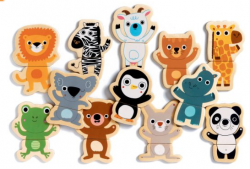 Djeco have designed a unique set of wooden animal magnets. Each animal is divided into 3 easy-to-hold pieces. 2 year olds and older children will enjoy mixing and matching the pieces. Some children will enjoy putting the pieces in the right order to create the correct animals. Others will find endless entertainment in creating weird and wonderful animals that have never been seen before! Of course, the magnets will stick to any magnetic surface such as a fridge. This means that 2 year olds can get extra fun from this toy by seeing what the magnets will stick to around the house. A lovely way for them to manipulate their environment without causing damage (no more paint on the walls)! With 24 wooden animals, you get a lot for your money. They are robust, well-made and the designs will not fade over time like a lot of toy magnets. Another unique game for 2 year olds, this toy helps to develop imaginative play skills. The pieces are easy for 2 year olds to grasp. To play, children need to match the frog, rabbit and cow to the pond, garden or meadow cards. They then pick a card and have to react when a card from their scene is turned over – for example if a child has the pond scene and they get a duck card. This nice simple game has a unique but simple concept. It’s a neat way to introduce young children and 2 year olds to more complex ideas such as association and reaction. It only takes about 10 minutes to play and can be shortened or lengthened to suit different attention spans. It’s aimed at children from 30 months up to 5 years, so in theory it probably best as a toy for more mature 2 year olds. However the concepts in this game are very simple and a younger 2 year old can still get plenty of fun from it. Grown-up dominos sets are too advanced for 2 year olds, but these colourful dominos will help young children to understand the concept of dominos in a more accessible way. The 28 pieces have colourful animals which 2 year olds can match together. The pieces are made from sturdy wood and the dominos set comes in a handy storage box, to minimise mess. Most board games are a bit too advanced for 2 year olds. This unique memory and reaction game is perfect for 2 year olds and is just right for their stage of development. This game consists of a set of cute, soft animal characters. To play, you lay out all the characters and take a minute looking at them and remembering them. Everyone looks away while one player hides one of the pieces under the cup. The first person to work out which piece is hidden gets a marker prize. Keep playing for as long as you like (depending on the child’s concentration span!) – the players with the most markers at the end of the game wins. You can make the game last as long as you like, but it typically takes about 10 minutes. This is ideal for 2 year olds and the game is advertised for children aged 30 months up to 5 years. You can play it in a more advanced way as the child gets older. Hammer benches and pound toys are popular with 2 year olds. They’re a great way to let out a bit of aggression, make a noise and generally have a lot of fun! Most hammer toys are quite similar to each other – a brightly coloured, generally wooden construction. I have seen slightly more unusual ones with lion shapes etc. However this is definitely the most unique one I’ve seen. Djeco haven’t just painted a chicken on the toy as a token gesture. They have really thought about how to incorporate the chicken and egg theme into the toy. The overall toy is shaped like a chicken. The balls are eggs on the chicken’s back. The hammers are chicks that pound on the eggs. When the child has successfully hammered the egg down inside the chicken, the egg comes out of a hole in the base of the toy, so the chicken actually lays the egg! This is much more satisfying than generic hammer bench toys, making this a truly unique toy for 2 year olds. 2 year olds love learning how to thread. At this age, the best toys have wide, non-fraying threads and large holes. Djeco have two unique threading toys for 2 year olds. Most threading and lacing toys for 2 year olds are quite boring and consist of cotton reels or beads with string. Djeco have used a more imaginative approach and produced some beautiful toys that will capture a 2 year old’s interest much more effectively. 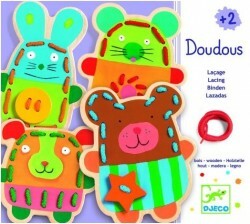 The Doudous early learning lacing toy consists of cute wooden animal characters. It has been designed especially for very young children such as 2 year olds to start learning lacing skills, which helps with their dexterity and concentration. This unique set contains 4 cuddly-looking animals with holes in for the lacing. It also comes with 4 colourful non-fray lacing cords and 2 shaped buttons (a star and a circle) which can be woven onto the animals’ clothes. This lacing set is a very unique toy because instead of threading something generic such as cotton feels, the 2 year old threads fun jungle animal heads onto a cord. There are 22 beads (animals, leaves etc.) and 2 laces. The beads have fun designs and soft felt features, making them a delight to use. As you can see, Djeco have designed many unique toys for 2 year olds. They’re not cheap but they certainly are special. Djeco passionately believe in combining art into play. This has led to the creation of many beautiful and unique toys which are entertaining, educational and informative. All of their toys have beautiful and colourful designs which are unique and eye-catching without being tacky. 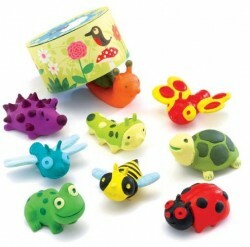 Most Djeco toys come in a beautiful storage box with a string carry handle that 2 year olds will enjoy carrying around. This makes them a lovely and unique gift for a 2 year old this Christmas or for a birthday present. If you buy a Djeco toy for a 2 year old, there’s very little chance that someone else will buy them the same thing! I think they make a perfect gift for 2 year olds, whether it’s for Christmas or as a birthday present.